Advocacy Day Is Three Weeks Away! 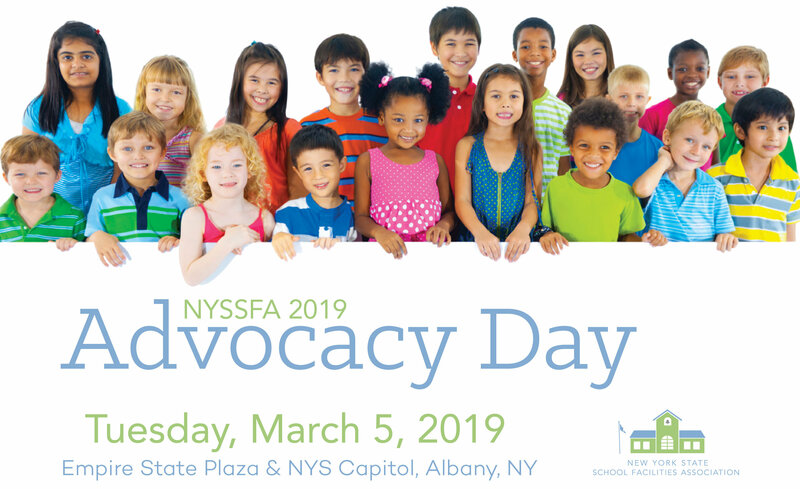 We gather in just a few weeks for Advocacy Day on Tuesday, March 5! We will hold TWO preparatory webinars with Hinman Straub: Wednesday, February 20 at 12 noon, and Friday, March 1 at 12 noon. Click on the dates to the left to register for a webinar. In addition, we will have an in-person briefing at the Hampton Inn Downtown Albany on Monday, March 4 at 6 p.m. (no registration required). You are encouraged to attend at least ONE of these sessions to review our talking points and schedule for the day. As always, our goal is to have all 18 of our Chapters represented in Albany on Advocacy Day. In doing so, we are able to meet with lawmakers and represent our school districts from all areas of the state. There is still time to register, but please do so quickly so we can organize your appointments with legislators. For assistance, please contact Robin at 518.465.0563 or info@nyssfa.com. Wednesday, March 6 is our Classrooms of the Future Summit. Experts will review the requirements and timetable of the Building Condition Survey (BCS) coming in 2021. Following that, our training program will focus on one aspect of the BCS: Mold remediation with Eileen Franco of the NYS Deptartment of Labor and Todd Crawford from the NYS Deptartment of Health. PESH Bureau representatives will be on hand with information and to answer your questions. As always, our Summit will feature a timely update from the State Education Department's Office of Facilities Planning. REGISTER today! Reserve your room for Advocacy Day and Summit at the special rate of $175 a night by calling The Hampton Inn at 518.432.7000 and using group code CHXA27. 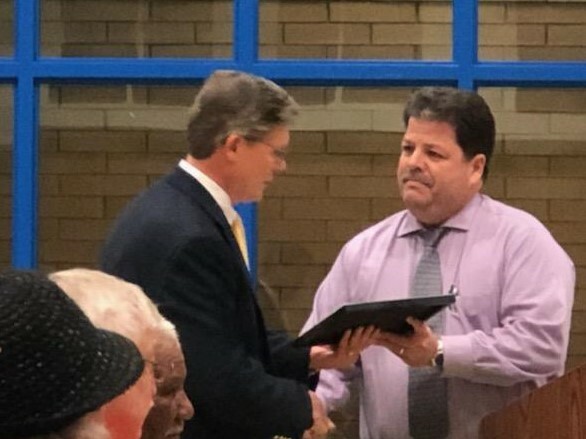 SFA President Paul Rooney (pictured far right) of North Rockland Central School District recently attended the Middletown City School District School Board meeting to present Thomas Scott with his CDF recertification. Tom originally attained his CDF in 2008 and is a member of the Mid-Hudson Chapter of NYSSFA. Scott and Rooney are pictured above with members of the Middletown School Board. We congratulate Tom on his achievement! A proposed greenhouse at St. Lawrence Central School will become a new classroom. “It will be for more of an educational experience. We’re referring to it as a STEM (Science, Technology, Engineering and Math) classroom. We wanted to involve all those disciplines in this area,” Superintendent Robert Stewart said. He said school officials visited SUNY Potsdam to see what disciplines the university offered in its greenhouse. That gave school officials ideas for its own greenhouse. “We have a lot of curriculum, especially in the science area, where kids learn but don’t have hands-on experience. This is all about creating that hands-on experience. It dovetails right into Next Gen (Generation) science standards that are coming out. We’d like to incorporate many different sciences, not just living environment and biology, but chemistry and physics,” Mr. Stewart said. The state Department of Health held a forum Thursday night at Elmira High School, fielding concerns from the public and explaining the next steps in addressing the long-running industrial contamination at the school. After giving a brief background of the state's awareness of the contamination and the studies that have been conducted since, officials tried to address the concerns of the public and faculty. On Thursday afternoon, officials from the Department of Health held a meeting with current staff before the evening session for former staff and the public. Employees and the public voiced concerns about soil testing, migration of possible contaminants and groundwater contamination. Several residents voiced concerns about other possible illnesses attributable to the types of contamination at the school, questioning why the studies and surveys focuses primarily on cancer. Beginning in early February, the district will open a Community Resource Center twice per month at Robert J. Kaiser Middle School where families in need of assistance with food, heating, employment, housing or any other challenge can meet with a caseworker to discuss options and begin the referral process. Long before an ex-student opened fire on his former classmates in Parkland, Florida, many school districts conducted regular shooting drills — exercises that sometimes included simulated gunfire and blood and often happened with no warning that the attack wasn't real.